In 2018, the world's largest electric ferries saw the light of day when they were introduced in Oresund, and in 2019, the shipping company Grimaldi is building new RoRo ships that are expected to reduce emissions by 30-40 per cent. "Now, the trend is accelerating," according to the industry. 23,000 tonnes of CO₂. That is how much less CO₂ the new battery-driven ferries in Oresund emit a year. In fact, they emit zero. They are the world's first high-frequency ferry routes fuelled exclusively by electricity. Onboard, there are 640 batteries weighing 90 kilos each. On the Danish side, they recharge for 6 minutes and on the Swedish side for 9 minutes. That is all it takes. Each crossing requires about 1,175 kWh. That corresponds to the consumption of an average household for one month. The ferries are the result of a targeted strategy to be fossil free, and without compromising on operations, mind you, explains Jens Ole Hansen, COO at ForSea. "Basically, the green ferries must continue with the same close-packed schedule as when the ferries were fuelled by diesel. We make 50,000 trips a year, and the ferries are in port for ten minutes at a time. With that in mind, we asked ourselves: How will we replace diesel with electricity?” Developing the ferries has taken some years, and there have been bumps along the way. Among other things with ensuring the connection to the charging station. "But that's how it is when you're innvovative. You must be ready for unexpected challenges when pushing the limits of what is possible," says Jens Ole Hansen. Global shipping constitutes about 2.2 per cent of total CO₂ emissions worldwide, and the environment and climate are high on the agenda of both the EU and UN's International Maritime Organisation, IMO, which passed a historic Climate Agreement last spring. It obligates the industry to halve its CO₂ emissions by 2050 as a step towards a complete phase-out. The agreement also aims to strengthen design requirements for all ship types. In Helsingør, Finn Wollesen can feel that demand for green technologies is growing. He is CEO of the design house Knud E. Hansen, which specialises in designing ships such as those for the RoRo industry. "The development has gained momentum over the past 10 years but right now it is accelerating," he says, explaining: "To begin with, it involved living up to rules and regulations but now it is also useful for marketing. Having a green image is worth money because customers are focusing on it. There's no doubt that being green will become an increasingly important competitive parameter." Knud E. Hansen designs ships for both DFDS and Grimaldi Lines. Recently, they were involved in designing Grimaldi's new Green 5th Generation, which is well under way and expected to be ready in 2020. The series consists of 12 new hybrid ships that can each transport about 7,800 metres of rolling goods, equivalent to about 500 trailers. The ships use a range of new technologies that when combined reduce their CO₂ emissions by 30-40 per cent. Three of the new ships will join Grimaldi's fleet in the Mediterranean. These are the ships that call weekly at Esbjerg and carry cargo such as food and cars. "We believe there will be a competitive advantage in being first movers because the climate agenda has momentum right now," says Jens Ole Hansen, COO at ForSea about their electric ferries that are crossing Oresund. Jens Ole Hansen at ForSea is sure the green focus is good business. Because even though the IMO has passed legislation that emissions must be reduced by 50 per cent by 2050, there are plenty of reasons to start straightaway. "We believe there will be a competitive advantage in being first movers because the climate agenda has gained momentum right now," says Jens Ole Hansen. And he also points out that it makes financial sense because the batteries are far more energy efficient. "Oil is not cheap at the moment and even if the price falls, a lot of waste heating is linked to sailing on diesel. That isn't the case with electricity," he says. He also points out that electricity-driven ferries were not really interesting until the battery technology took off. In recent years, the development of batteries of the calibre that ferries require has accelerated. "We have made this investment because we feel it makes good economic sense," says Jens Ole Hansen. The battery technology is not the only technology currently progressing in leaps and bounds. An ocean of new technologies is seeing the light of day. Technologies that together contribute to considerably greener ships. For Finn Wollesen and his 94 employees at Knud E. Hansen, it is always a question of the ship type and needs when developing the right green ship design. For cruise ships, ventilation plays a crucial role. And for RoRo vessels, optimising the logistics flow is in focus. "If we optimise the flow so that containers and cars roll on and off quickly, it reduces the time spent in the port. This means the ship can reduce its speed when sailing, and that helps reduce fuel consumption significantly," explains Finn Wollesen. In addition to optimisation of this kind, Knud E. Hansen and Grimaldi have together implemented a number of new technologies on the new generation of RoRo vessels. This, for instance, involves a battery pack that enables running exclusively on electricity when the ships are in port. There are also various systems onboard that reuse energy. For example, heating is converted into electricity, and a special technology can convert sulphur emissions into gypsum, which can be reused in port. Finally, the hull has a special air lubrication that adds a thin coating of air around the hull and reduces water resistance. Together, the technologies help reduce the ships' CO₂ emissions by 30-40 per cent compared with today. Similarly, the size and the optimised flow mean they are twice as effective as the existing ships. This significantly reduces energy consumption per transported tonne. Finn Wollesen explains that the green solutions must make sense from a business perspective otherwise they are not included in the design. "Our task is to design vessels that are as efficient as possible to ensure value for money for our customers. We screen and choose equipment that works and contributes to both CAPEX and OPEX," he says, adding: "Here, green solutions are more and more interesting because they contribute to efficiency and thereby also the financials." 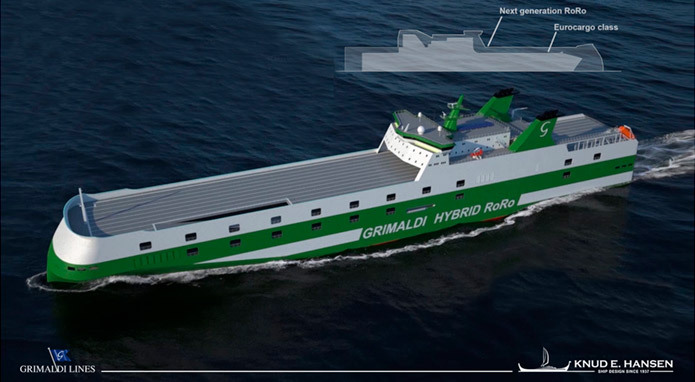 Grimaldi's new Green 5th Generation ships are expected to be ready in 2020 and comprise 12 hybrid vessels. Three of them will join Grimaldi's fleet in the Mediterranean. Ships from there are those that call at Esbjerg once a week. At the Danish Maritime Authority, the development of the new technologies prompts new ways of regulating the sector, explains Per Sønderstrup, Head of Centre of maritime regulation and law. The speed presents challenges when developing regulation. "We risk regulating something that will be replaced by something else in a year's time." Therefore future regulation is more about setting goals than micro-management. "Put simply, we today require ships to have two lifeboats and six life jackets, but in the future we might to a greater extent make it clear that ships must have life-saving equipment to save everyone on board. It is about creating room for innovation," explains Per Sønderstrup. The trend is global, he says and he predicts that we will see more target-based rules in the future, so the industry will to a larger extent compete more based on goals rather than on defined standards. One example is the IMO's latest climate agreement where the ambition to reduce emissions by 50 per cent works as an overarching goal. "Now, the industry and authorities must team up to achieve this goal," says Per Sønderstrup. One example of the kind of collaboration necessary is in the field of batteries. Here, the Danish Maritime Authority has recently entered into collaboration with the industry and classification societies to explore the options and challenges presented by the battery technology together. Per Sønderstrup's colleague Martin John, Director, Ship Survey, Certification and Manning at the office for maritime safety, explains that the collaboration is symptomatic of what the development demands. "Regulation must not limit development, however there are also important safety concerns to bear in mind when dealing with batteries," he says. The new collaboration will explore the opportunities of battery technology and reveal the challenges. That is the only way Martin John and his colleagues can develop relevant regulation. And knowledge sharing is precisely what is needed, he feels. "The technology is so untested that we must learn from each other's experience. We are experiencing great demand for knowledge and networking from the industry, where we together explore the opportunities presented by the new technology." The collaboration in the field of batteries will result in standards for certification that can apply to the industry in general. They are currently not available. At ForSea, Jens Ole Hansen welcomes common certification standards. In connection with the new electrical ferries on Oresund, obtaining approval from authorities has been complicated because there are no rules in force. "We included the authorities in the development from the outset, and that was vital," he says. Another important player, when it comes to development, is the port. This applies e.g. to the establishment of onshore power, which makes it possible for the large RoRo vessels to switch to electricity when in port. For electric ferries on Oresund, the opportunity to quickly connect to onshore electricity is vital. In fact, connecting must take no more than one minute. Then the ferry must charge approximately 1,175 KWh in 6-9 minutes. "We have developed a robot that connects the charging cables to the vessel in under a minute. It must do this 96 times a day for the two ferries, with tip top regularity," explains Jens Ole Hansen, pointing out that this creates demands on the power available in the port. The ferry battery packs need a 10 MW connection to optimise charging during the minutes available. The infrastructure in the ports is also a focal point at the Danish Maritime Authority. Martin John explains that many of the new technologies make demands on the onshore facilities. This does not mean the ports must be able to cover all these bases at once, but they will have some choices to make. "I believe that more and more ports must make some strategic choices about how they will support the green development and new technologies. Should we pursue supplying ships with electricity from shore or LNG, for example? Taking the right course of action will require major investments, so the individual ports must consider the matter carefully," he says, adding: "In the future, ports such as Esbjerg must increase their scope for experimenting with the new technologies. The port will be a development partner that can contribute to the development via intelligent infrastructure." Neither Finn Wollesen nor Jens Ole Hansen have any doubts that green technologies are here to stay. ForSea has, in fact, set its sights on becoming completely fossil-free, so the shipping company's other vessels must also be fossil-free in the long term. "Ten years ago, I honestly didn't think this would be possible," says Jens Ole Hansen. However, the development of the battery technology has progressed rapidly, with the batteries becoming both better and cheaper. Jens Ole Hansen will therefore not exclude that the development will ultimately enable the use of batteries for longer crossings. "For large vessels and long crossings, a combination would be interesting. For example, can battery packs be implemented so the ships sail on battery power in coastal areas?" Finn Wollesen also points out that combining the technologies does the trick on the large vessels. Grimaldi's new ships are an example of how a range of different technologies can be integrated to optimise the potential benefits. This also means that some of the technologies will disappear again. But that is the nature of innovation, according to Per Sønderstrup at the Danish Maritime Authority. "Right now, progress is being made within automation, batteries and scrubbers, while experiments on natural gas, hydrogen and ammonia as fuels are also being conducted," he says. He thinks there are many good new initiatives at the moment. "But it takes many drops to make an ocean, and perhaps that's how it should be. Who knows, perhaps the development of a new, clean energy source is right around the corner." Martin John also points out that Denmark has a good basis for pioneering the development due to our extensive maritime knowhow. "We are good at both thinking up ideas and testing them in practice, partly because we have clusters like the ones in Esbjerg, where new ideas can evolve in practice. It could certainly be an important competitive parameter for the Danish maritime sector, if we work hard and don't rest on our laurels," he says. Jens Ole Hansen, COO at ForSea and Finn Wollesen, CEO at Knud E. Hansen. The two sister ships Tycho Brahe and Aurora shuttle across Oresund between Helsingør in Denmark, and Helsingborg in Sweden. Each ship has room for 1,150 passengers and 240 cars. There are 640 batteries onboard weighing 90 kilos each. The total weight of the vessel is increased by 280 tonnes. On the Danish side, they are recharged for 6 minutes and on the Swedish side for 9 minutes. Each crossing uses about 1,175 kWh. The conversion to electric operation has cost almost DKK 240 million, of which the EU has contributed almost DKK 100 million. Comprises 12 new hybrid vessels that are 238 metres long and have a gross tonnage of 64,000 tonnes. The ships use fuel while sailing but electricity when docked. While sailing, they obtain electricity from large lithium batteries that are recharged during the crossings by generators running on solar power. The ships have a special air lubrication system comprising a special type of lubrication on their keel, which via small bubbles on the surface, reduces friction and thereby fuel consumption. The ships are also covered by a special silicone paint that reduces friction. The ship has a technology on board that exploits the chemical reaction between the sulphur and salt in seawater to produce gypsum, which can be recycled or disposed of onshore.